And what a debut it was. As had been speculated, coach Don Lever tapped 19 year old Carey Price to start in goal against Rochester and he reponded by stopping all 34 shots in a 2-0 win for Hamilton. Once again he looked calm, cool and composed way beyond his years. After the game Price said "It was a lot of fun because the guys help me a lot, helped me to see the puck and they did a good job of clearing the rebounds." How significant was the win? 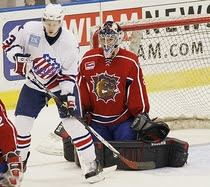 Price's performance snapped a 9 game playoff loosing streak against Rochester who came into the playoffs with the 5th ranked offense in the AHL. Also of note, both Andrei Kostitsyn & Mikhail Grabovski were both scratched from the game.